(AP) COLORADO SPRINGS, Colo. - Berets are back for the U.S. Olympic team. 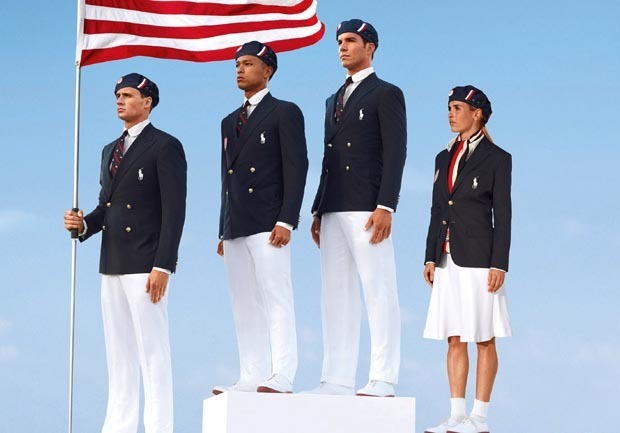 The team unveiled buttoned-up, refined uniforms designed by Ralph Lauren Tuesday for the opening ceremony at the London Olympics. Men will wear navy blue blazers with the Olympic team patch, along with a red and navy tie, and cream-colored flat-front pants. Women will pair the blazers with scarves with red, white and blue stripes, and a knee-length cream-colored skirt. All the team members will top off their uniforms with navy berets highlighted with red and white stripes. The marketing folks can only hope these berets go over as well as they did in 2002, when the U.S. team wore powder-blue berets at the Winter Olympics that became instant hits and quickly sold out at stores around Salt Lake City. The company said in a statement the outfits aim to embody "the spirit of American athleticism and sportsmanship." Ralph Lauren also is dressing the Olympic and Paralympic teams for the closing ceremony and providing casual clothes to be worn around the Olympic Village. Nike has created many of the competition uniforms for the U.S. and outfits for the medal stand.